Is what we experience in our day to day lives just the tip of the iceberg? We’ve always loved bizarre facts and snippets of information, particularly if they fly in the face of accepted wisdom. Even better if they get the old grey cells working as well. Some relate to the world around us. Others are health related. But our favourite are those about how our minds work. Or, in some cases, don’t work (!). And, even more so, people’s reactions to these new insights. Into what goes on between their ears. Well, not always between their ears, but that’s definitely a subject for another day! What fascinates us is that people tend to assume they know exactly what’s going on in their heads. And that they are fully in control of it. Oh, and it’s the same for everyone. However, research has shown the exact opposite. That much of what goes on inside our heads happens automatically; without us ever being aware of it. What we see is the end result of this process, neatly packaged up for us. If this sounds far too surreal for you, here’s a bizarre fact we came across years ago. Every second our brains receive millions of pieces of information. Not only from the traditional five senses we’re so familiar with – taste, touch, smell, hearing and sight. But also from a plethora of other senses too. Mention is often made to there being 53 of them; although we have no doubt more will be discovered as research continues. These include the sense of gravity, atmospheric pressure, pheromones, psychic capabilities and self. Many of these are linked to the five traditional senses but extend them much further. So how much of this flood of information are we consciously aware of? The answer if very little. Amazingly, research has shown that we can only consciously process about 40 pieces of this information every second. The rest is filtered out long before it reaches our conscious minds. If you stop to consider this – even only for a second (!) – the ramifications are huge. That we’re only aware of a miniscule proportion of what’s going on around – and within – us. While we assume we have a full picture of what’s happening, we only ever have a selective snapshot. And that brings us on to the most interesting question of all. Who – or what – determines what information is passed on to our conscious minds and what’s filtered out? How does this sorting process work? The answer to the “who / what question” is simple. Our subconscious minds. Much greater than the conscious mind, the subconscious works quietly in the background processing this flood of information 24 hours a day, 7 days a week. It doesn’t matter whether we’re awake or asleep, the process continues unabated. While the conscious mind needs some “down time” every day – in other words, sleep – the subconscious doesn’t. The “how question” is much less straightforward. From the moment we’re born – and long before that according to some research – to the moment we die; our subconscious is being programmed. Or more accurately, our programmes are constantly being tweaked, updated or, sometimes, replaced completely. But from what, you may ask? Well, our experiences, beliefs and a host of other factors. If you’d prefer a simple analogy, a computer related one works well. The subconscious mind is like your computer’s operating system. The supporting platform for all other programmes to run on. It may be hidden in the background but, without it, nothing else functions. 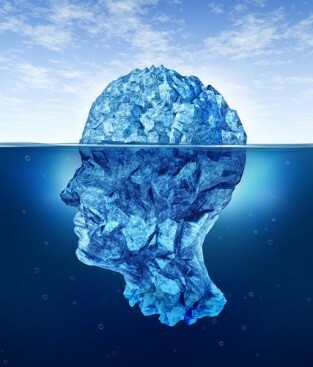 Or, put another way, the conscious mind is like the tip of the iceberg. The bit we see above the water. What isn’t obvious – unless you take a look – is that the majority of the iceberg is hidden below the water. And that, for us, is our subconscious mind. So now you understand our choice of picture this week! What’s most scary is that all of this is going on without us ever being aware of what’s happening. And is used to help filter which information is passed on to our conscious minds. To how we experience our day to day lives. We know that to some people this will all sound too surreal for words. It couldn’t possibly be true. But we all experience this process in action every day. We just don’t realise it. Whether it’s something we watch on television, listen to on the radio or encounter first hand; we’ll each experience it slightly differently. And that depends on how our subconscious minds filter the information coming in. So what is finally passed on to our conscious minds. Oh, and just to make things even more complicated; how our conscious mind finally experience it. A simple, everyday example, is when we sit down to watch something on television with friends or family. Have you ever noticed that each person experiences the programmes slightly differently? One may particularly notice the background music. Another what one character said / did. Or one particular plot or sub plot. One person may see the programme as very sad and upsetting. While another only noticed the happy ending. Sometimes it can seem that each person is watching a completely different programme! As you go about your day, take a moment to notice how differently we each experience the same event. Sometimes the differences can be tiny, so easy to miss. Other times they are instantly obvious. If nothing else, you’ll quickly realise how much we miss as we go around our day to day lives. And, perhaps, you’ll then want to go down this particular rabbit hole a bit further with us.